As part of the Latin American Environmental Organizations Day celebrations, the Council of Bogota honoured ADI’s work in Colombia to protect wild animals and our campaign to save Nala. Read more about Nala here. 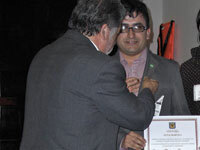 Campaign co-ordinator Eduardo Peña was also awarded with a certificate of recognition for his work at ADI by the Bar Association in Lima, following a presentation on the use of legislation in protecting animals. Donate now and help us do more to protect animals. Visit adi_suramerica to find out more about what we do in Latin America.